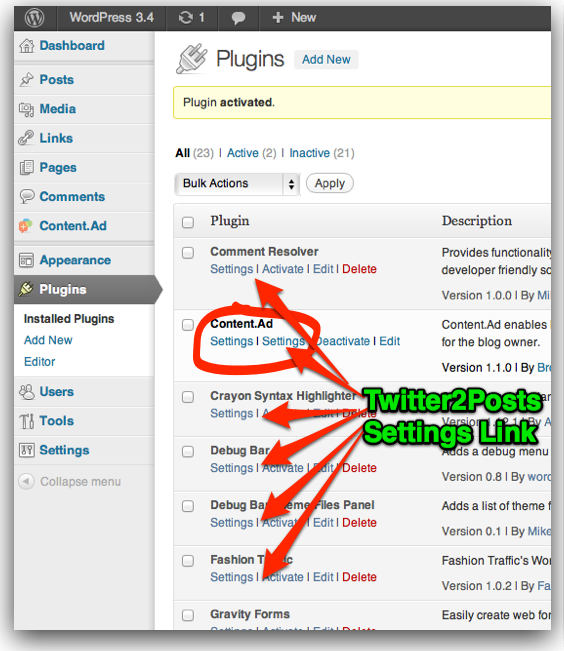 If you would like to import tweets into your WordPress site and save them as posts, I found a new free plugin yesterday called Twitter2Posts which will do exactly that. You can choose a category for these to be saved into, I like the idea of this – it could be used for a side-blog or latest news section of your site, or simply to just have a more permanent record of your twitterings! In this post we’ll take a look at how to install and configure this plugin. Once it is uploaded, click “Activate” under the plugin. Hit “Save” and then visit “Settings” > “Twitter2Posts” on this settings screen you can enter your twitter username, a category name for the tweets to go into and choose a refresh delay – depending on how often you tweet. I liked this plugin – does exactly what it needs to and no more. A criticism would be the settings page – its rather elaborate with image background and other styling, this is not needed – just make it match the WordPress UI and it would be a lot more elegant. Bringing tweets into a personal blog in the main feed is a good idea as tweets gets lost once posted – this is a way to have a permanent record of them on your own blog. Could also be used on business site for short updates or statuses for customers. P.S. I was also disappointed to learn it didn’t use a custom post type and instead dumps all the tweets into the list of posts. But I’m sure that will work for some people.